The new Heavy Grips uses industrial strength springs to develop your grip strength and to increase your hand and forearm strength. 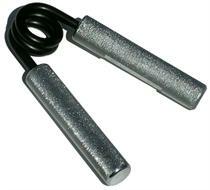 The Heavy Grips Are sold in increments of 50 lbs. ranging from 100 to 350lbs. The secret is in the amount of force required to close the grips, because the Heavy Grips require more force to close, they will build muscle and strength faster. Most other hand grips require only 40 lbs. of force to operate. Email your friend about the Heavy Grips. Ask a question about the Heavy Grips.